15-inch wine cooler refrigerators are ideal wine storage units for built-in placement under the kitchen counter. With only 15″ width these compact home appliances are perfect fit for replacing the trash compactor in your kitchen to provide the required storage conditions to preserve the quality of your wines. Manufacturers offer a wide range of 15-inch wine coolers regarding style, decor, and number of temperature zones. This page is a guide to some of the best models to help you select a unit the satisfies your wine storage needs, matches your home decor, and meets your budget. Small 15 inch wine coolers can store around 18-24 bottles of wine. There are both freestanding and under counter built-in models available so you can choose the best for your needs. The Vinotemp 18-bottle wine cooler refrigerator is for freestanding use only but it still takes up little floor space and it will be a useful home appliance that matches any modern home decor. Read more on Thermoelectric Peltier Wine Cooler Refrigerators. 5 pull-out chrome shelves that are scalloped to cradle the bottles safely, each shelf holds 3 standard size bottles of wine, you can place 3 more bottles on the bottom, on the floor of the cabinet. easy-to-use press button controls for setting the temperature in the range of 54-66 deg. Fahrenheit (note that the unit must be placed in a room when the ambient temperature is max. 77 °F, in a warmer room the cooler won’t be able to cool to and maintain the set temperature, this is one major drawback of thermolectric wine fridges). the control panel also includes the switch for turning on/off the blue interior LED lighting. Note that all Vinotemp wine coolers are designed to have 5 degrees temperature fluctuation inside the cabinet which prevents the appliance from excessive cycling thus providing more energy efficient operation. Price of the Vinotemp 18-TEDS 15 ” wine cooler refrigerator: cc. US$ 230 – 350 ( US$ 12.78 – 19.44 per bottle). Wine Enthusiast has some a slim, 10-inch wide 18-bottle model with two zones. The Vinotemp VT-26 15 inch wide wine refrigerator is a compressor-run, single temp. zone unit designed for under-the-counter built-in placement (sells for around $1000). The Viking Under Counter Wine Refrigerators have either 15″ or 24″ width and 24 bottles storage capacity. In the high-end category the Marvel Luxury Series Wine Cellar, model 30WCM is an elegant narrow model (width: 14.88″) that you can build in your existing kitchen cabinetry. Another narrow model by Marvel is the 24-bottle 3SWCE wine cooler. 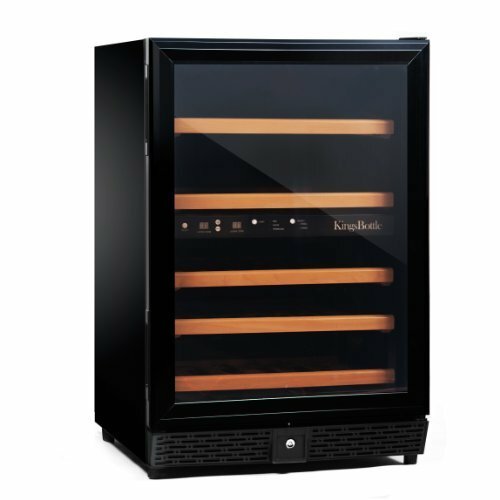 Marvel wine refrigerators are equipped with some unique features (Vibration Neutralization System, Sentry System, Sabbath Mode) providing the best environment for storing your wines. 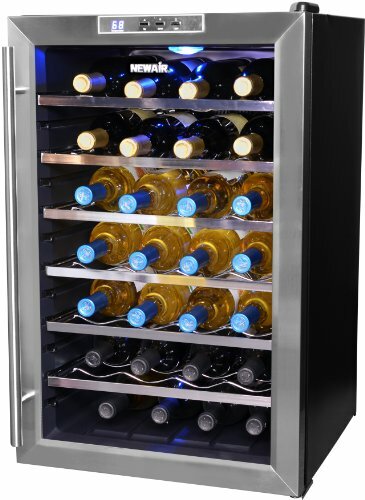 The Summit SWC1530 is a nice, compact, compressor-operated wine fridge that fits under the kitchen counter. 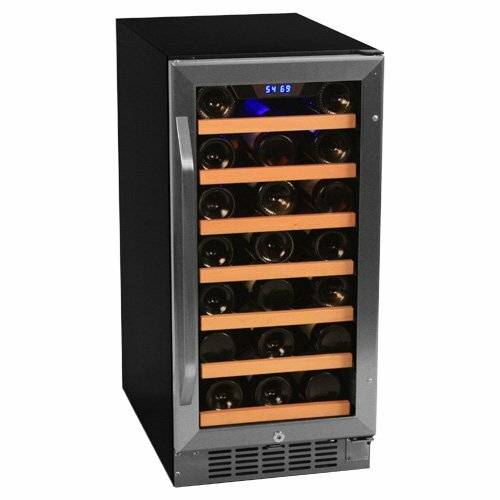 It holds 28 bottles of wine and has one temperature zone, electronic temperature controls and LCD display. 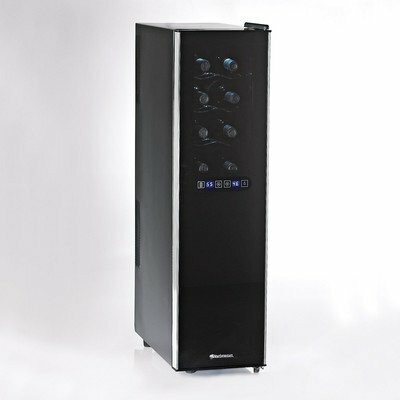 The Avanti WC1500DSS 15 inch wine cooler stores up to 30 bottles of wine. This is a single-zone, compressor-run unit that costs around US$ 500 – 550 and can be placed as a standalone unit or built in in the kitchen cabinetry. white cabinet with white door trim. The 15″ wide Danby built-in wine cellar holds up to 34 bottles of wine. This is a small capacity thermal electric wine cooler with less than 14 inch width and for built-in installation. Black cabinet with black-framed glass door, door glass is dual pane for better insulation and amber-tinted to provide protection of wines from UV rays. The door handle is recessed providing sleeker design, and easier placement. The control panel with touch buttons and blue LED display for both zones is integrated in the top door frame. With the touch buttons you can easily adjust the temperature for both compartments: between 46-66 °F in the upper zone (good for chilling whites) and between 54-66 °F in the lower compartment (ideal for storing red wines). Thermoelectric cooling technology ensures fairly silent operation, without vibration ensuring that the sedimentaion in wine won’t be disturbed. Placement: standalone only, because it vents at the back. Price of the Haier 18-bottle wine cellar: cc. $140 – $200 (7.8 – $11per bottle) which makes it a very low-priced 15″freestanding home wine cooler, perfect for the occasional wine drinker. TIP: See more Wine Cooler Reviews on various sizes, styles and brands. 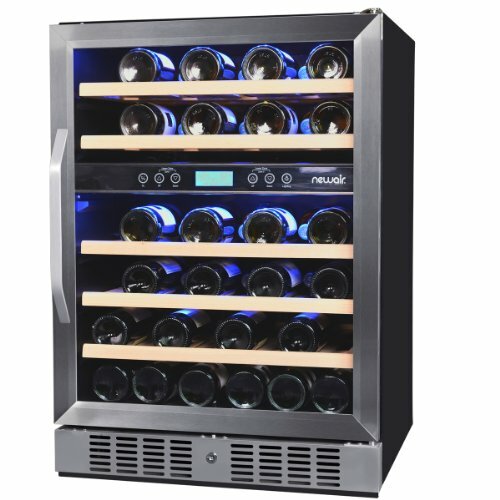 The U-Line 2115WC Wine Captain is a high-end 15 inch under counter wine fridge with 3 independent temperature zones. It can accommodate 24 standard-size bottles of wine.